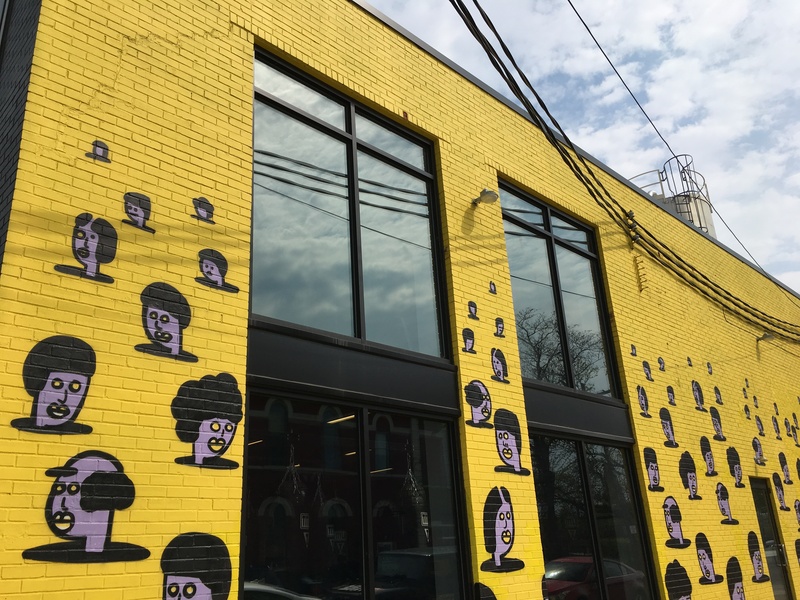 TL:DR – PyCon was great, you can delete your terminal, you can get it back, Cleveland is great and has a lot of good coffee. PyCon was and will be in Cleveland for the 2018 and 2019 conferences. I was really looking forward to the Cleveland trip this year and the city did not disappoint. Good coffee, good friends, good food. Did you know that you can delete your terminal!? You can! Seeing the terminal disappear and not being able to call it back is a pretty unsettling sensation. Basically, I installed a newer version of Python and that messed with my system’s ability to call a few things, like the terminal (gnome-terminal specifically). So that was unsettling, but I stayed calm and headed to search engines. Using Google and DuckDuckGo on my phone and laptop, I searched for answers. I found that this is a known bug- More here!, and I fixed it by opening XTerm and using this: UbuntuHandbook resource. So, not too bad overall, I didn’t brick anything and I learned more about XTerm! Okay, back to the tutorial- Well not quite- first was a coffee stop at historic West Side Market – The market reminded me a lot of Philadelphia’s Reading Terminal Market in all the best ways- delicious pastries, amazing meats, people connected to food in many ways, from farming, to events, to your weekly groceries. I walked around, admired all the food, and got a latte to go from City Roast Coffee and Tea. Fresh coffee and a working laptop- okay now we’re at the tutorial, all systems go. I liked how Melanie structured the time we had- it was more than code. She built in information about how we learn, how we relax, and how we can handle frustration. I really appreciated the information and the pacing. I also really liked how the files were set up- Melanie preloaded a zip file with many Python files- BUT these files had just the prompts really, and maybe a little bit of code here and there. So, instead of looking at a blank page, you immediately had a folder full of files to work on. This was awesome! Instead of futzing with what to name things and how to start, we could just… start! It was especially good after the conference too. I kept working through the exercises and syncing w/ my GitHub repo when I had something new to add. A number of talks touched on failure. I also just really love telegraph cables. A talk I saw later- thank you PyCon for recording talks! Testing is a healthy part of good work, and I learned a lot from this talk. The variety of code editors intrigues me, and I really liked a lot of the “why”s at play here. Art = code, code = art. We all have a capacity to be hurtful and damaging in our critiques, OR to be curious, constructive, and empowering. Another talk drawing links from different fields. Highly recommended! PyCon openspaces! This year I led one. 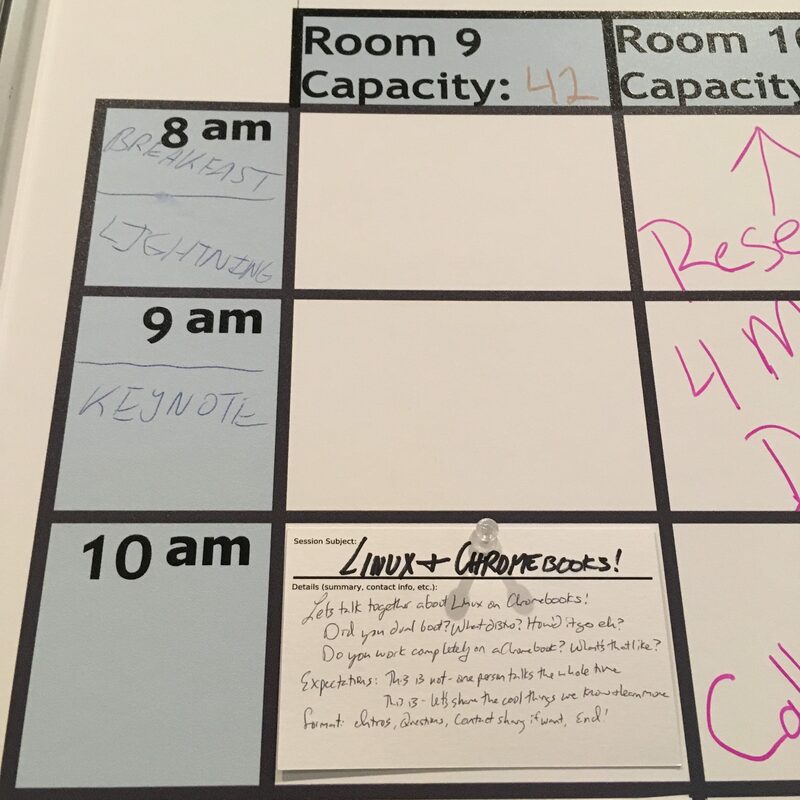 It started because I was talking to a few people about Chromebooks and Linux, and they encouraged me to hold an openspace on the subject. So I did! I led it as a guided discussion, first asking everyone to introduce themselves, and say what laptop/Chromebook setup they had. I also passed around a notebook with some questions- that data is below. I was curious about how people were using Linux and Chromebooks. Linux can be so lightweight and powerful, and same for Chromebooks, especially with the new support for Linux apps. Plus, in Crouton you can have the Linux environment as a tab. Some common threads- a lot of security folks, folks who like hardware, like Raspberry pi, and who travel to other countries. It was fun to hear people talk about what worked for them, and in some cases see the Chromebooks or other tools. One in particular that looks really fantastic is a fully powered mini laptop (netbook makes it sound too cheap; this was a solid gadget) called the GPD Pocket. I got to see a Pixel Chromebook in person, that was pretty cool and it’s definitely a quality machine. Most people who were using Linux and Chromebooks didn’t dual boot and didn’t have a higher-end model like the Pixel. Instead, they were using a Chromebook/Asus/Acer netbook and SSHing into their home machine. The “why”s were pretty similar for everyone- security was a big draw, some interestingly powerful sandboxing APIs, and the flexibility/ease-of-mind to travel with a tool that if stolen, wouldn’t be as bad as having a $3000+ laptop stolen. I started the discussion thinking that Linux and Chromebooks overlapped a lot- and they do- but throughout the talk it became less of a one-to-one overlap and more of a Venn diagram. Some people used Linux and were just curious about Chromebooks. Some people used Chromebooks and had heard about the Linux capabilities, but hadn’t done too much (yet). And some people were integrating the two. I wish I had more time at the sprints! I was able to stay for the first morning, and headed straight to the Adafruit table. Adafruit generously gave attendees a Gemma, and I look forward to doing more with it. 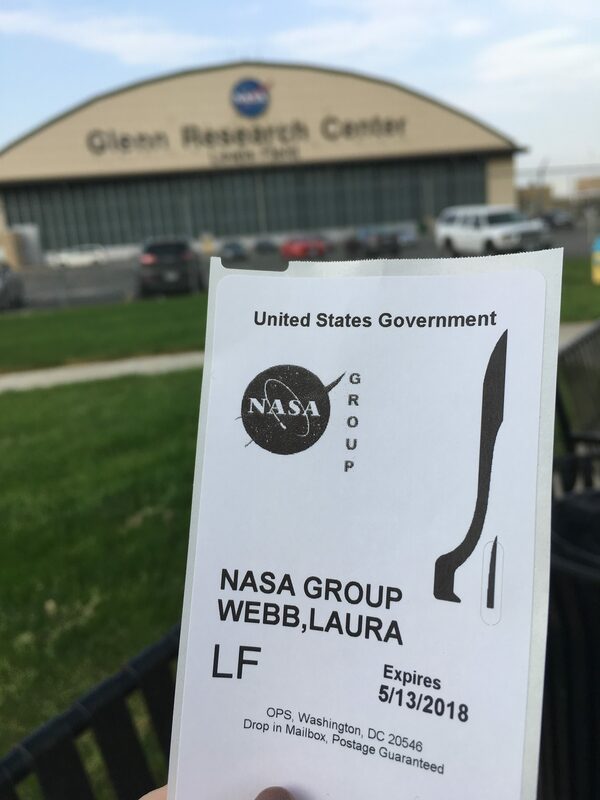 I learned about the NASA Glenn Research Center thanks to the PyCon Cleveland guide. The NASA research center offers tours once a month- with the May tour taking place during PyCon! It’s a bit trickey to get in- tickets are first-come, first-serve, and there are only 4 tours of 25 people each on that one day a month. Tickets become available a month before the tour date- so for the May tour, I requested a ticket at 12:01AM on April 12th. A request doesn’t guarantee you a spot. I got a ticket though!! May’s tour was specifically focused on the wind tunnel machine– a single machine that is larger than a city block. It uses so much power it’s only run at night. This machine tests space models and on the tour we were able to stand inside of it- if that machine had been running a test we would have died. It was fantastic! Only sad thing- no pictures. If I could have taken a picture of just one thing, (believe me I asked) if would have been the GIANT simplified one line power diagram that filled an entire wall. This diagram predates alllll the computers in the room. It’s a line schematic of the wind tunnel machine with lights that corresponded to the actions and health of the giant machine at many different points. It was SO COOL. A city-block’s worth of machine information distilled into a full wall panel of lines and lights. If I could have taken two pictures, the second picture would have not been a computer/diagram/machine, but instead a handmade object- Along the tour I noticed a wooden tool chest- a big one- and one of the fellows was telling me how it was handmade by one of the engineers who also made, you know, the rockets that sent people into space. And that was beautiful and I wanted to take pictures of it and look at it more. Space travel has deep connections to craft. It’s so obvious in these spaces- craft and creativity and ingenuity. Big fan. From stumbling upon one of the largest chess collections in the world, to NASA, to an abundance of good local tea & coffee spots, I left with more to see and am looking forward to going back. For the past couple of conferences I’ve meditated in a garden- generally I’ll put a tweet out saying where and when, and then lead a guided meditation using Headspace in a green space. I didn’t do that this time and I wish I had. Thanks to a tip from another attendee I found this coding article that mentions Python and as I was sharing coffee recommendations with a friend, he found this article about Duck-Rabbit Coffee. Wiggenstein shows up in both, and I want to end this post with that observation- an observation without a conclusion, but with a lot of appreciation for the time spent in this particular city. Thank you PyCon team, Cleveland fantastic people, and cheers to everyone working on their craft.